Although the bear came out of his cave, during the past weeks he was deeply disappointed in his own weather forecast. So tomorrow morning he sets off to Odessa to enjoy a bit of Mediterranean air. Whoever travels with him, will enjoy his route through Maramureș – the ancient land of bears –, the Carpathian Mountains, the city of Czernowitz shaped by the Austro-Hungarian Monarchy, the multiethnic plains of Podolia and the Southern Russian steppe, which we have already sketched up. And whoever stays at home, can keep track, via the following map and report, if not minute by minute, at least available wifi spot by wifi spot, of where he is roaming and what he is doing. Check back soon. The last and longest section of our trip: eight hundred kilometers in one day (the upper re route), because we wanted to avoid the shorter, but worse road we took there. In the morning we had a sunrise sightseeing in Kamenets-Podolsk, and after breakfast a commemoration at the memorial of the “stateless” Hungarian Jews executed here in August 1941, attended by the president of the local Jewish community, who told us in detail about the mass murder of 1941. On the way from Kamenets to Khmelnytsky we were stopped by a taxi driver asking us to take over his passenger who missed the bus in Kamenets, and to take her to the train station in Khmelnytsky. The Hungarian Jews enthusiastically welcomed Rebeka, the English teacher of the Las Vegas Jewish school, who now teaches English at the university of Czernowitz, and who gave us a detailed presentation on the Jewish life in Las Vegas. The long road provided an excellent opportunity to everyone to indulge in the pessimism caused by the potholes and to make his or her bet as to when we arrive at the last stop of our trip, the restaurant in Ungvár/Uzhgorod. And lo and behold: even the latest bet was lower by ten minutes than the reality, half past eleven at night. Which at once shows that the roads did not make us that pessimistic. The road through the Carpathians passed by the evocation of the common repertoire of urban and folk songs, and the last, Hungarian section by sleeping. Thanks to the Hungarian consulate in Uzhgorod, we crossed the border at a record time again, in about one hour. After three thousand kilometers, at half past four in the morning we returned to our starting point, the Heroes’ Square in Budapest. 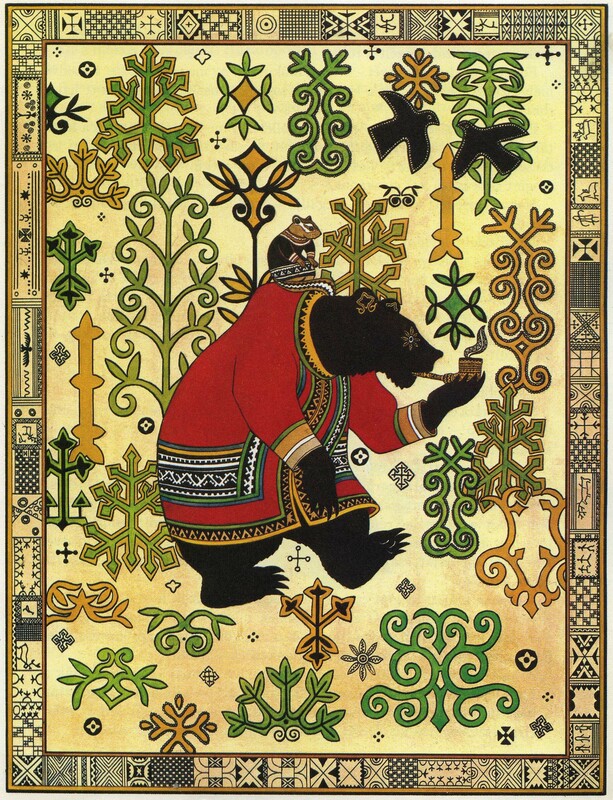 And the bear turned to east again, ready for new trips. As usual, we asked each fellow traveler to write and send photos to a common post, which will be hopefully up on Río Wang in the first days of the next week. 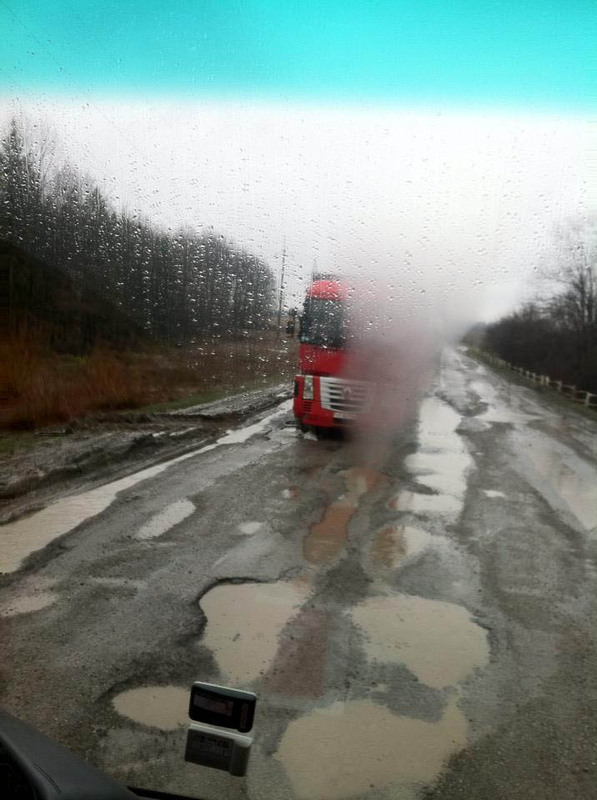 Through the Southern Russian steppe, through the plain of Podolia, and behold: the potholes are busily being stopped up. This is also a philosophy: repairing a road not once and well for the next twenty years, as in Germany, but letting thousands of industrious ants on it every spring, to patch it in a few days, from winter to winter. Just be careful not to come here in the two weeks after the winter destruction and before the spring patches, as we did now. 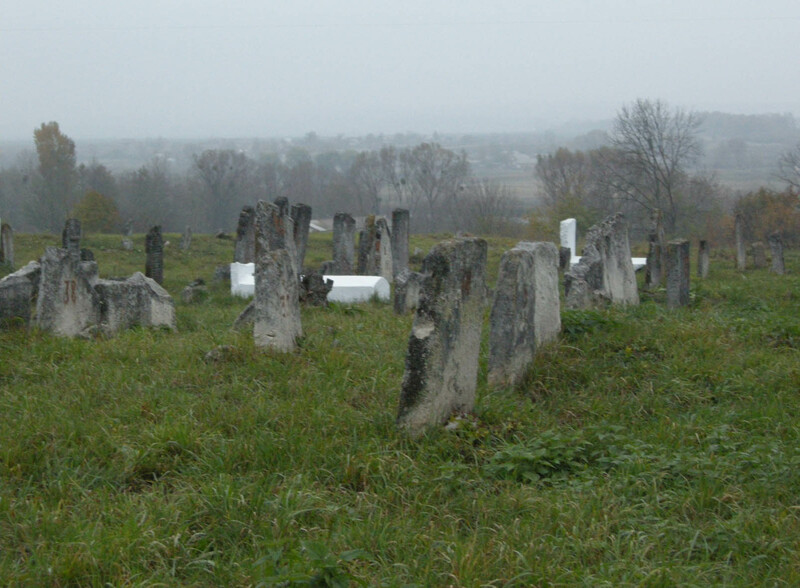 Uman and Medzhibozh, the two most important Eastern European Hasidic pilgrimage sites, the graves of Rabbi Nachman and his great-grandfather Baal Shem Tov. On the bank of the Bug river, which widens into a lake here, at the feet of the fortress built against the Ottomans, a centuries old wooden synagogue, surviving Hasidic headstones in the foreground of the forests and long-stretching hill ranges, a really sacral landscape. Back in the bus several people says that perhaps this was the most beautiful part of our journey. One must know how to have a good time. 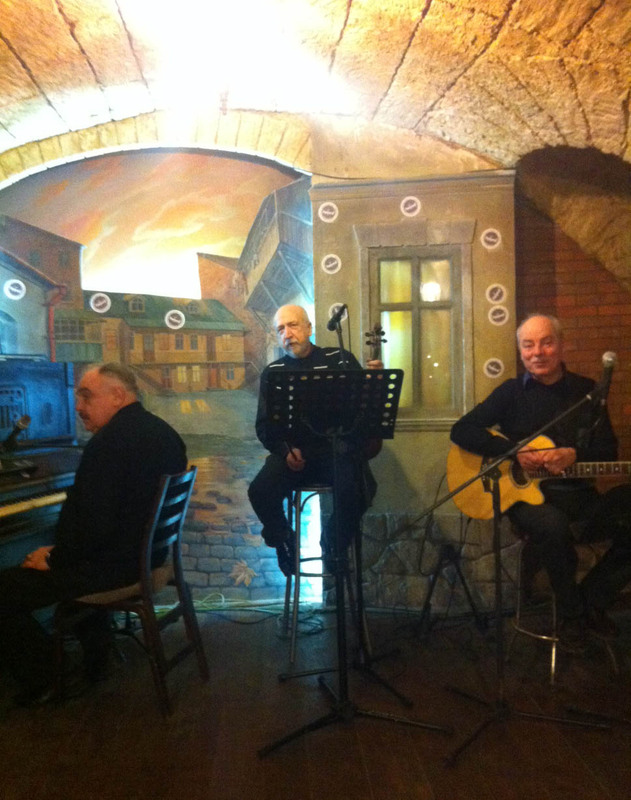 It was well known by the Russian company, who sat together with us at the farewell dinner in the Gambrinus pub at the Deribasovskaya, where they play Odessan blatnye pesni, bandit’s songs and old Russian chansons, and who ordered for us the following song, the “unofficial anthem” of Odessa. And it was known by those members of our company who defended the rollicking reputation of the Hungarian nation at the dance floor. And last but not least by Andrea Deák, secretary of the Hungarian Jewish Cultural Association and organizer of this tour, who gallantly paid for the music. Thanks to all of you. 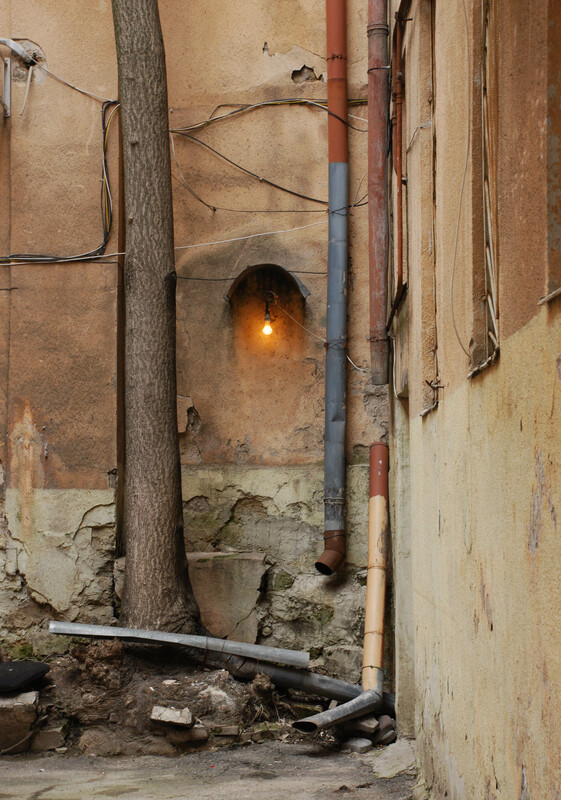 Spring has finally arrived to Odessa, too, even if only in the last day. The sunshine and warmth makes this already beautiful city even more beautiful. We walked about the gray zones between the downtown and Moldavanka’s underworld, in former industrial areas, bohemian neighborhoods, along the Freeport Street described by Kataev, we have visited the last traditional Russian bath operating since 1861, and the century old Lutheran church recently restored on German costs, crossed the Odessa Gulf on the board of Khadjibey, and the enterprising spirits visited with me the 20th-century exhibition of the excellent Museum of Literature. 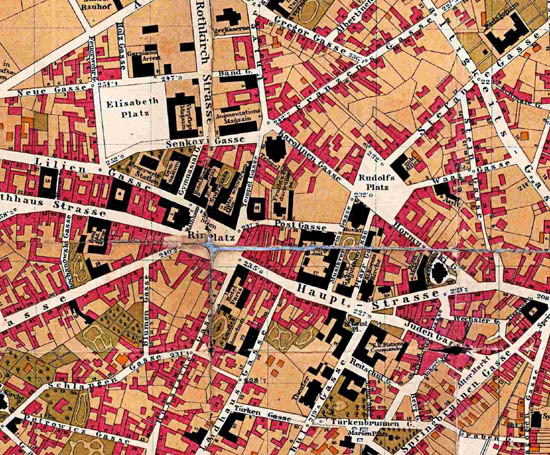 And as a worthy conclusion of the three-day sightseeing, I have led the company through a maze of interconnecting downtown courtyards, and at I have shown at the end the secret court, which I love most in this city. As to which one this is, let it remain a secret to be disclosed for those who will come to Odessa with me. The two most intensive days of the Odessan tour. No wonder that the tour guide has no time to write reports, when during the day he introduces the visitors into the city’s secrets (and they are really secrets, because in Odessa there are hardly any city guides, plaques or other public information), in the evening he organizes the program of the next day and goes about restaurants, and at the breakfast he fixes the details of the day’s program with the company. Starting from the corner of Deribasovskaya and Rishelievskaya, we have toured the neoclassicist old town, the seaside promenade, the Greek quarter, the Moldavanka, the world of Babel’s mythology, the Jewish street – considered the longest street of Odessa, because, due to the KGB center standing here, “its beginning is in Odessa, and its end in the Gulag” –, we have visited the Migdal Jewish cultural center and its house museum, and walked about the checkerboard-like historicist downtown. When at Uman you join the Odessa highway, pay to the police standing in ambush the penalty of two hundred hryvnias (after an intense haggling, starting from eight hundred on the one hand and fifty on the other), and finally sit down in the café of the high-class Azerbaijani gas station, you feel like having arrived to Europe. The Moscow-Odessa highway, where the rich Russians glide through during their weekend and summer excursions to the warm southern sea, is completely different from the Ukraine lying on its two sides, both in the language (everything is written in Russian instead of Ukrainian), in the level of service exceeding even the Western European standards, and in the fact, which cannot be estimated enough, that it has not a single pothole. We almost feel ourselves rich Russians as we glide through it to as far as Odessa, with a hot Azerbaijani sandwich in the hand. Not only the lack of wi-fi spots, but also that of time makes choppy the on-site coverage. Thursday morning we crossed the Ukrainian border – thanks to the car sent by the Hungarian consulate in Ungvár/Uzhgorod, within a record time of one hour –, and the programs have since been following each other without interruption. 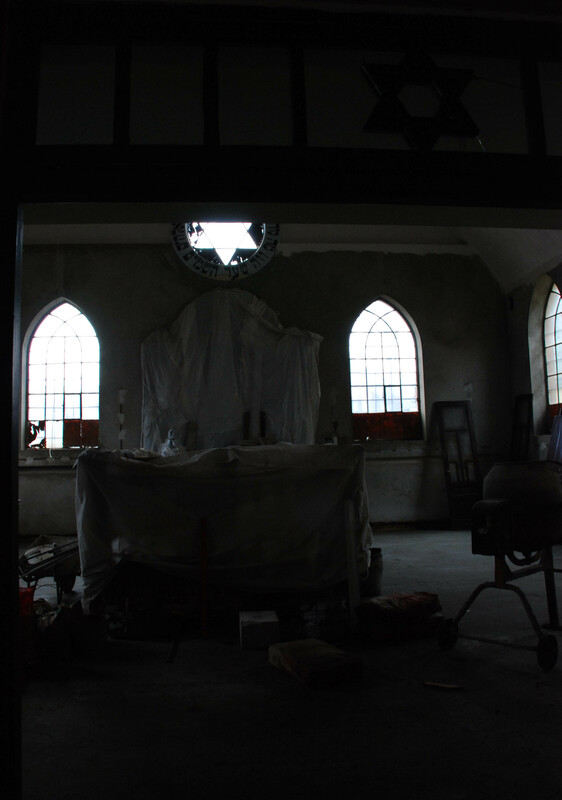 In Beregszász/Beregovo we were invited to visit the small synagogue in Zrínyi street (formerly an ammunition storage) recently given back to the local community, who try to restore it with great efforts. The road leading through the little town was a real time travel: our fellow traveler Rozi, who grew up in Beregszász, recounted from house to house who were lived and to where emigrated, or where they organized entertainments in the sixties. The road outside the town, however, was no entertainment any more. As we proceeded, I desperately tried to remember where the bad road should usually end, perhaps at Huszt/Khust… perhaps at Rahó/Rakhov… but in the end it never ended. 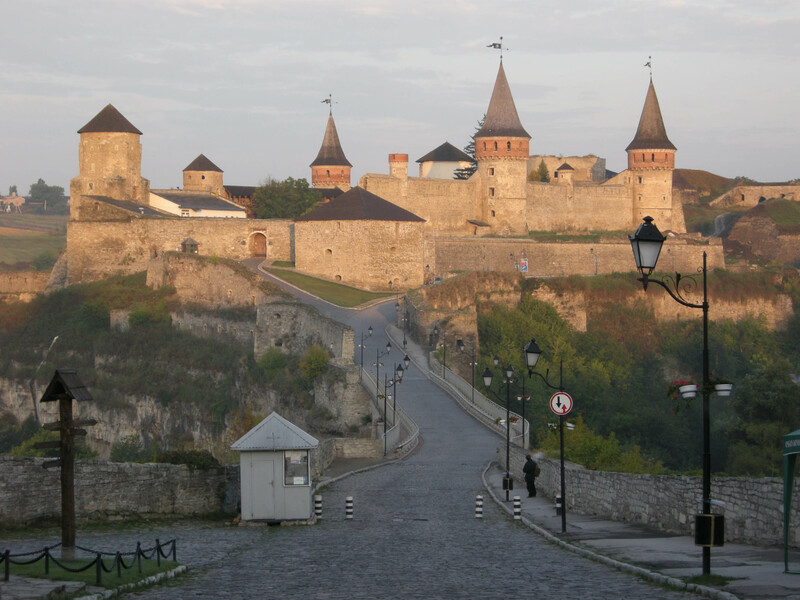 And yet we can consider ourselves lucky, because the road on which we stumbled along the Cheremosh river to Czernowitz at three a.m., was closed the next day with a proclamation of a state of emergency. In Czernowitz, before we participated in the Friday evening candle lighting at the invitation of the local Jewish community, we walked three hours in the downtown, starting from the central Ringplatz, to the former Elisabethplatz – the Theatre Square created by the Jewish bourgeoisie – to the Rudolfsplatz – the Philharmonia Square established by the Greek-Romanian magnates – and to the south, from the Judengasse through the Türkenbrunnen to the Armeniergasse, visiting as much as we could from the centers of the former thirty ethnic groups of the city. A special beauty of the sightseeing was that we had received some orders from the descendants of long-time Czernowitz emigrants to take a picture of their former homes, but on the basis of the old Austro-Hungarian addresses. 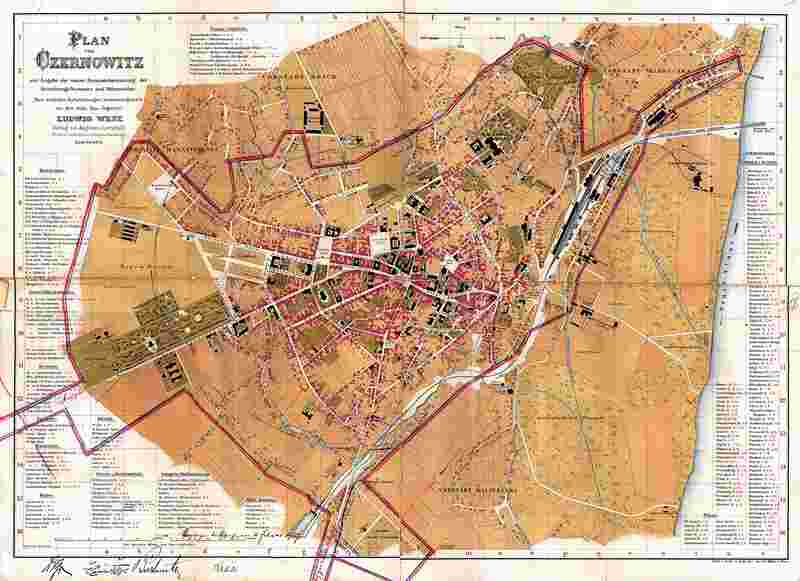 However, with the old Austro-Hungarian map of Czernowitz, which is always with us, this did not cause any problem. Ukraine’s main spring crops are the potholes. When the first ray of the blessed sun melts the ice hiding in the cracks of the road surface, and then the broken-up asphalt is washed away by the spring floods, the roads of Ukraine are converted into one huge war theater hit by bomb raids. And one million potholes cannot be wrong. As General Winter stopped in Russia the German offensive, so Partisan Captain Spring stops, with the strategy of the scorched asphalt, the Blitzkrieg of the Hungarian Jewish Cultural Association to Odessa. We slalom at a speed of 40 km/h from Beregszász/Beregovo through Podcarpathia, Maramureș, Pokuttya and Bukovina to Czernowitz, and arrive at 4 a.m. to the hotel instead of the planned 8 p.m. of the previous evening. But apart from that, we had a beautiful journey. More after sleeping. After sleeping and speaking with the Hungarian consulate, it turned out that Ukraine is hit by a general deterioration of the roads due to the record cold winter, and the country has become virtually impassable in the past two weeks. 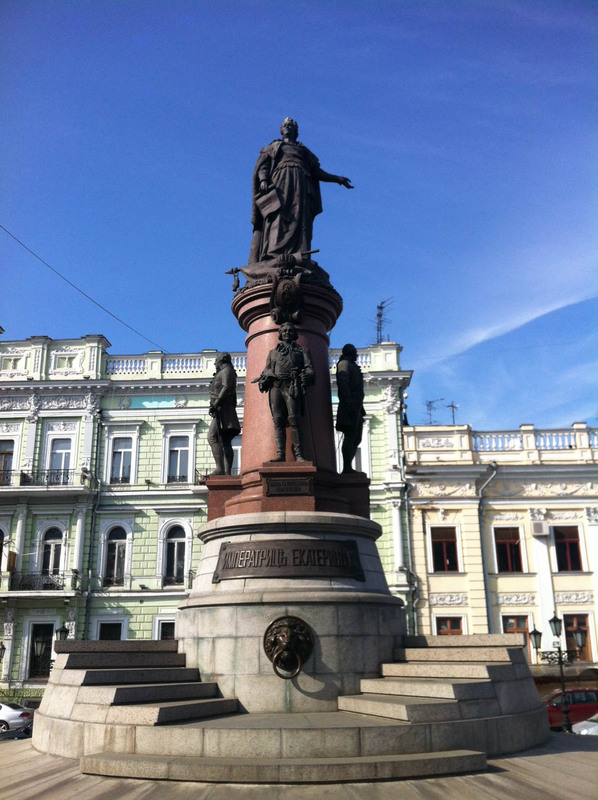 The Budapest Operetta Theatre launched a tour from Ungvár/Uzhgorod through Lemberg and Ivano-Frankivsk to Czernowitz with the Czardas Queen, it is already plastered all over Czernowitz, but it is still uncertain whether the truck drivers carrying the equipment and scenery are willing to come this far on these roads. We definitely offered that if all else fails, we are going to act the roles. In the afternoon we already had a first rehearsal in the bus. 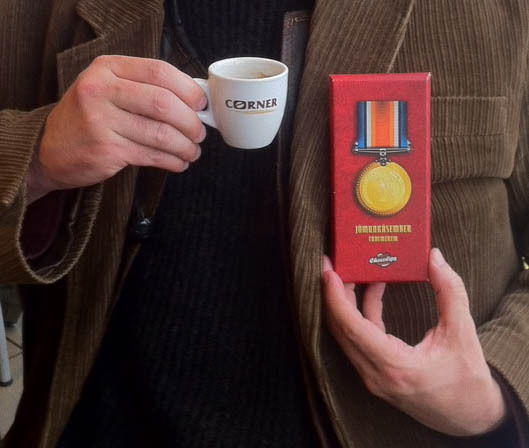 the bear had already his first success: at the gas station of Görbeháza, still half asleep, he received, well in advance for his accomplishment on the road, a Medal of Good Worker. This is no award, but a burden! he’s still anxiously spotting the Eastern road, and he is pondering whether he packed enough honey for the journey, an extra fur for the Tatar Pass, sunscreen for the tropical shores of the Black Sea, but above all how he would be able to be there tomorrow at 4:30 a.m. in Budapest’s Heroes’s Square, at the bus. He’s grateful for any good ideas. Glad to hear good news from you,. 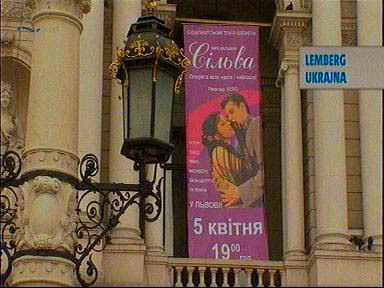 But -oh you cruel man - we are eager to know Odessa secrets.